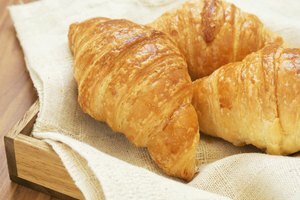 Freezer-cooking, or cooking food for the purpose of freezing, and freezing leftovers are two distinct food-storage techniques that are bound to the same food-safety guideline: Food needs to cool to room temperature within two hours to minimize bacterial growth. This guideline has the same significance with meat and other proteins as it does with vegetables and starches like potatoes. Baked potatoes -- whole, stuffed, loaded and twice-baked -- retain their quality for about one month in the freezer with proper preparation before freezing. The freezer-preparation technique is the same for leftover baked potatoes as it is for baked potatoes you cook specifically for freezer storage. Unseasoned potatoes, baked to just before full doneness, yield better quality upon thawing than fully cooked bakers. 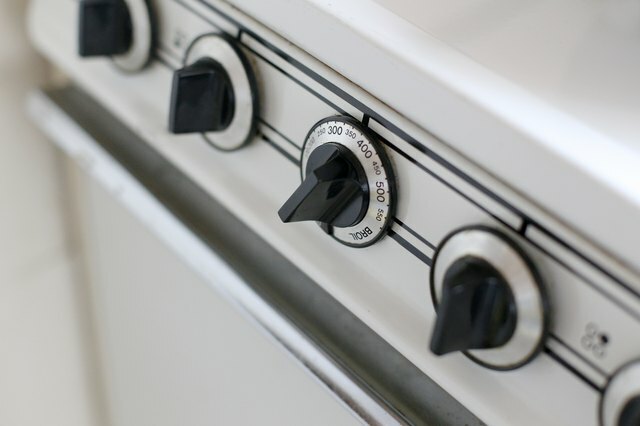 Fat doesn't freeze well, so refrain from oiling them before baking or only apply a thin sheen of cooking spray -- a wrapping of heavy-duty aluminum foil provides enough protection from drying in the oven. Don't season the potatoes, either. Salt works on the potatoes until they reach zero degrees Fahrenheit, so they would continue losing moisture from their skins and from just below their surface even during freezing. 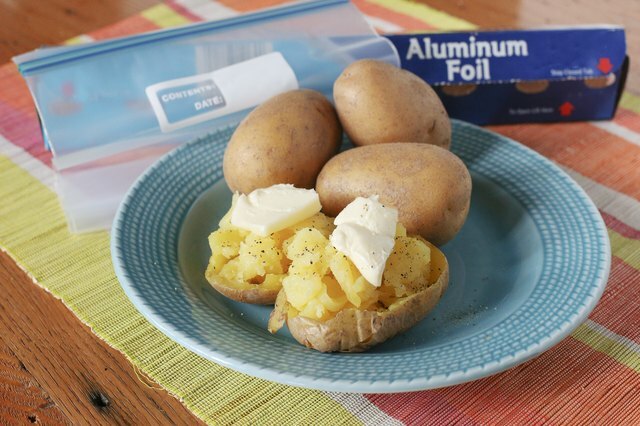 To freeze whole baked potatoes, poke several holes in them using the tines of a fork, and wrap them in one layer of heavy-duty aluminum foil. 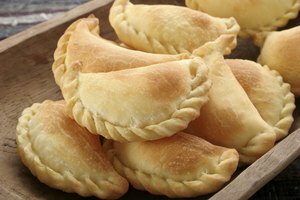 Bake the potatoes for 30 to 40 minutes -- 30 minutes for medium-sized and 40 minutes for large -- and unwrap them; they should be slightly firm in the center. Let the bakers cool to room temperature on a sheet pan, and then place them in the freezer. Freeze the potatoes uncovered until they're solid, about one hour. Then wrap each one again in heavy-duty aluminum foil and place them in a heavy-duty freezer bag. Mark the date on the bag before you place them in the freezer. Use the same technique -- cool to room temperature; freeze uncovered until solid; wrap in foil and pack into freezer bags -- for leftover baked potatoes. The texture of loaded, twice-baked and stuffed potatoes holds up well to freezing -- unless you add sour cream and green onions, so delay garnishing them with those ingredients until after you thaw and reheat them. Freezing damages green onions' structure and alters their taste, and sour cream separates, causing a soggy potato interior. Although cheese doesn't freeze well either, there are exceptions, namely, processed shredded cheddar -- the type typically used on loaded and stuffed anyway. If you're using shredded cheddar, you can add it to the potatoes before freezing. You can also add bacon, sauteed mushrooms and any other freezer-safe ingredient before freezing. 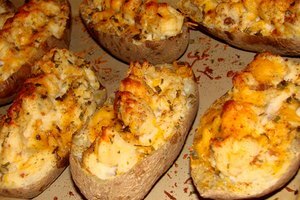 To freeze loaded, twice-baked and stuffed potatoes, fully cook them first in a 350 F oven and prepare them according to the recipe -- but without sour cream or onions. After the potatoes cool completely, arrange them on a sheet pan and freeze them uncovered until solid, about one hour. Then wrap each in aluminum foil. Pack into freezer bags and label. 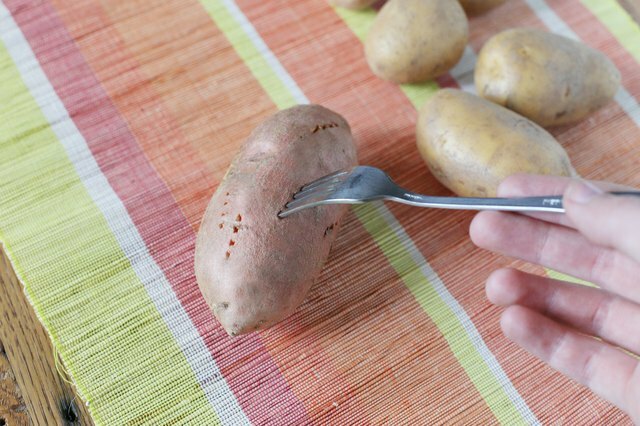 Use the same technique for leftover stuffed potatoes. 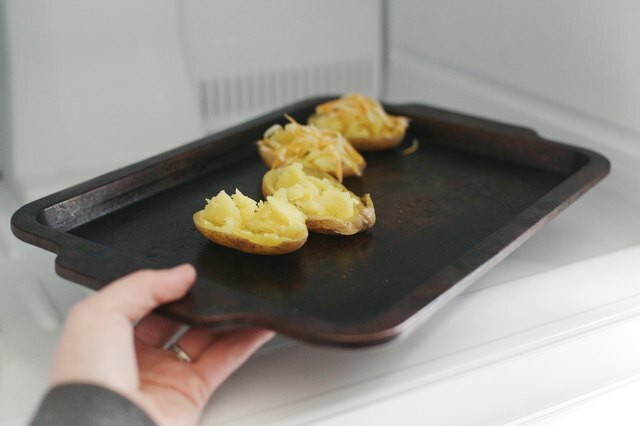 You thaw and reheat all types of baked potatoes the same way: Unwrap them, arrange them on a sheet pan, and heat them in a 350 F oven until they reach 165 F in the center -- about 45 minutes to one hour for both stuffed and whole baked potatoes. You don't need to thaw baked potatoes in the refrigerator or at room temperature, and it's best you don't -- the faster you get them from frozen to 165 F the better, as it leaves little time for them to cultivate bacteria or crystallize and weep. You can reheat up to four medium-sized baked potatoes or three large potatoes in the microwave at once. 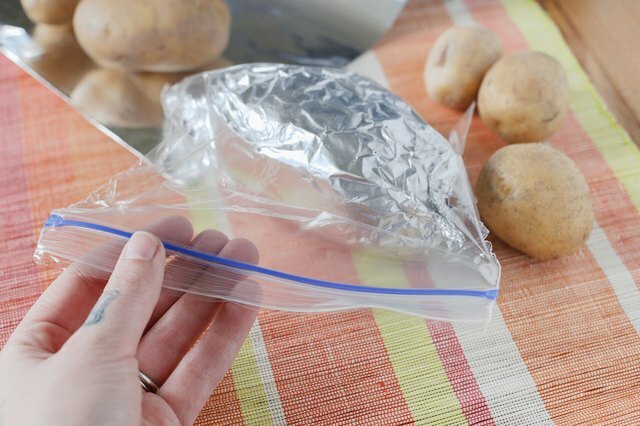 Arrange the potatoes at the edges of a microwave-safe food container or dish, and cover it with plastic wrap. 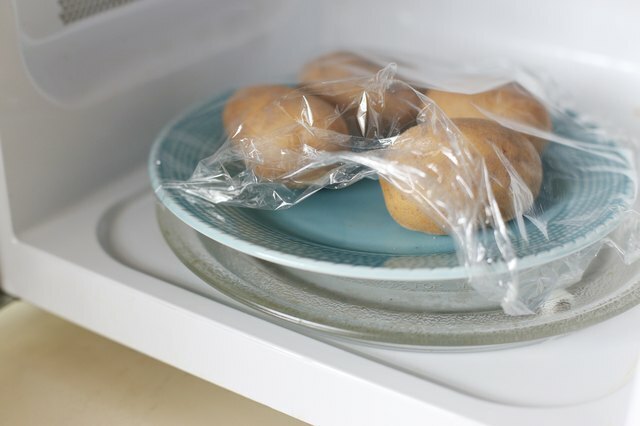 Lift one corner of the plastic wrap to let the steam escape, and microwave the potatoes on high for 3 to 4 minutes per potato, or until they reach 165 F in the center. Reheat stuffed, loaded and twice-baked potatoes in the oven rather than the microwave for best results. The Food Channel: Can You Freeze Sour Cream?